Shortly after midnight on this date in 1913, Joe Richardson was hauled out of jail in Leitchfield, Kentucky, and lynched on the town square for attempting to assault an 11-year-old girl (white, of course). 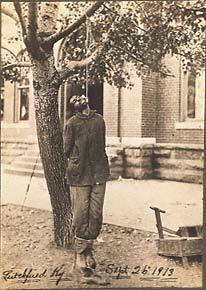 photographs rendered the violence of a lynching visible and accessible to a wider audience. Although, as will be shown, the public for these images was imagined as relatively narrow or contained, they nevertheless seemed to punctuate the lynching as a public spectacle. Small posses that quickly lynched their victims outside town but paused long enough to take pictures intended their actions to be witnessed … ‘the [Richardson] mob worked quietly and most of the citizens of Leitchfield knew nothing of it until the body was found hanging from a tree early this morning … A large crowd congregated … after the hanging was reported.’ A photograph of Richardson’s hanging body was mounted on a card and peddled door-to-door by an unknown photographer.